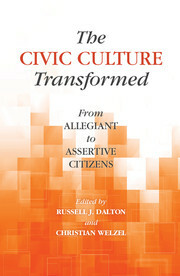 New volume "The Civic Culture Transformed: From Allegiant to Assertive Citizens" available now! New volume "The Civic Culture Transformed: From Allegiant to Assertive Citizens" published by Cambridge University Press under edition of Russel Dalton and Christian Welzel in honor of Ronald Inglehart - available now! A new volume "The Civic Culture Transformed: From Allegiant to Assertive Citizens" published under edition of Russel Dalton and Christian Welzel in honor of Ronald Inglehart by Cambridge University Press is available soon. This book re-evaluates Almond, Verba, and Pye's original ideas about the shape of a civic culture that supports democracy. Marshaling a massive amount of cross-national, longitudinal public opinion data from the World Values Survey Association, the authors demonstrate multiple manifestations of a deep shift in the mass attitudes and behaviors that undergird democracy. The chapters in this book show that in dozens of countries around the world, citizens have turned away from allegiance toward a decidedly 'assertive' posture to politics: they have become more distrustful of electoral politics, institutions, and representatives and are more ready to confront elites with demands from below. Most importantly, societies that have advanced the most in the transition from an allegiant to an assertive model of citizenship are better-performing democracies - in terms of both accountable and effective governance. 12. From allegiant to assertive citizens by Christian Welzel and Russell J. Dalton.